It’s sad to compare United States seafood to the rest of the world. The freshness is rarely noteworthy and the variety is downright limited, as evidenced by my surprise live sea urchin find months ago. On a stroll through a Spanish grocery store, there were six different kinds of prawns, all twitching, three different squids, countless clams and mussels, and endless varieties of fish. Presumably, the unadventurous American palette, combined with the treacherous American work week, has left little discriminatory demand for the tastiest food on the planet. 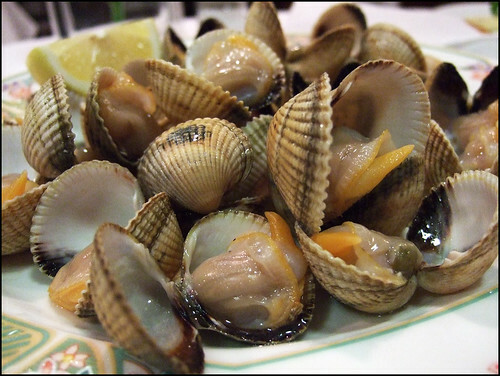 Rias de Galicia was billed as an “old school” seafood spot where a respected chef told me that I could expect to eat “reference” items (i.e., seafood that I would compare all others to.) After an earlier disaster that week at Combarro in Madrid (largely described similarly by others), I was apprehensive. But it was the last day of the trip and a bad seafood meal in Spain might be better than a good one here in the US. 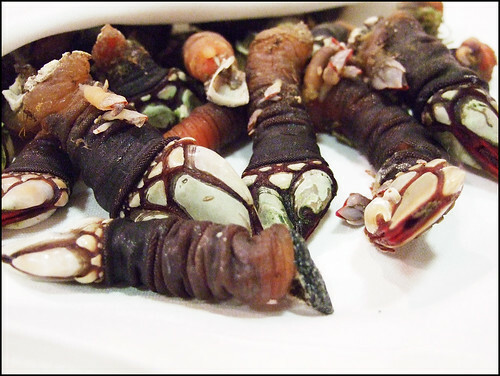 Who would expect barnacles would be so tasty and so much fun to eat? Twist the claw-looking thing from the teflon-like tube enclosing the meat and try not to squirt barnacle juice everywhere. The meat has an excellent iodine inflection while being satisfyingly chewy. They are usually the most expensive item on the menus, aside from maybe langostine, but completely worth the price. Very Good. Very fresh, a taste somewhere in between mussels and clams. The clam taste is muted with more of the iodine of a mussel. Very Good. Not as refined as Etxebarri in San Sebastian but a delicious plate of grilled baby octopus. Good. Stupendous – I’ve never had octopus this fresh. It was barely cooked, still oozing with slime, the pepper possibly a little heavy-handed but satisfyingly spicy. This will forever remain a reference item and, combined with Jaminisimo’s ham, a reason in itself to book a ticket to Barcelona. Excellent. 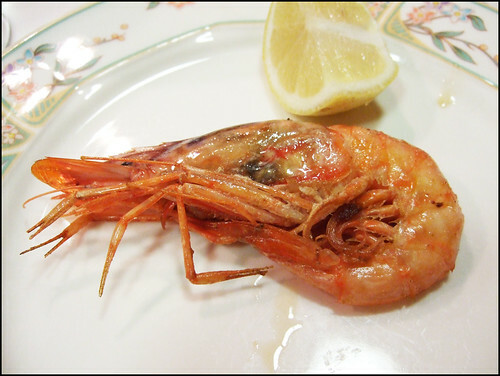 A tasty prawn that was marred by being overcooked. You can’t win them all. Ok. It looks so deceptively simple but this meal was very good. If I lived in Barcelona, and my bank account held out, it would be a weekly affair. This meal wasn’t cheap – it ran 150 euros/person before wine (thank the percebes.) If you were to go in baby eel season, or order other fancy items like langostines, that bill could easily double. Regardless, it’s worth every penny for that octopus. Those Barnacles look awesome! I am so envious!!! Thank you for consistently posting your reviews, they are always interesting. 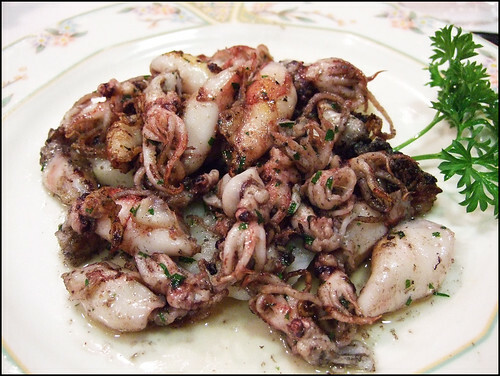 A thought on the Galician style Octopus: is it really possible to “barely cook” this? Usually there is way too much collagen in the muscle to allow for this cooking method. Michael, I suppose that’s a question for a cook (as I assume you are) – but I can describe the sensation in more detail: it was very tender, barely warm in the center, and quite slimy. Maybe it was steamed, or boiled, and allowed to sit afterward? Its flavor was also quite intense for octopus. My name is Pablo and I live in Barcelona. Just a brief comment about the way of cooking the octopus. You can buy it fresh or frozen. If it’s fresh yo have to spend time beating the octopus with a wooden tool trying to break the tissues. Be careful if you don`t want to break it. If its frozen there is no problem because this freezing period breaks the tissues. This mas the octopus meat tender and a little bit gelly. Then the octopus is boiled with potatoes and served. Everybody here freezes the octopus and the is boiled. Congratulations for your web site and my apollogies for my english. Next time please visit GAIG, managed by Carles GAIG. I want to read your comments !!! I lived 14 years in Barcelona and Pablo is correct in the way octopus is cooked. For the best results with a fresh octupus, clean thoroughly, beat it with a bat, a dough roller or some other wood implement. What he did not mention is that the potato is put into the boiling water at the same time the octopus is put into the water. 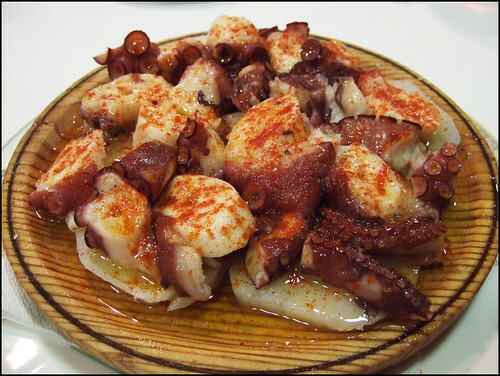 When the potato is so cooked that it starts to fall apart when poked with a fork, the octopus is ready to eat with the best virgin olive oil you can find and hot Spanish paprika. And to return to the wood implement. There is some fact (or lore) involved in this. Supposedly, using metal on an octopus makes it taste bad or somehow negatively affects it, which is why, in most places I ate octopus, it was served on a thick round wood “plate” and to pick up piece of it to eat, you usually are supplied with toothpicks. Oh, yes, sprikle salt on the octupus, in crytsal form, or kosher salt, to taste too.